Beyond the Olive is different than the other olive oil stores. We only carry exclusively produced and bottled in California extra virgin olive oil – not shipped over and imported from Europe. This way we can control the product. Our partners are small producers. We are committed to supporting our local economy, and California crops. We are a small business, doing our best to share our passion with the world. Come visit, taste, learn and let us share our love of olive oil with you. Epicure Lisa Grabow recently posted an Instagram picture with the caption “I’ve got olives in my pockets, olio nuovo in my mouth and hand and customers on my mind. A delicious day!” It neatly sums up why she can accurately call her business Beyond the Olive. Grabow’s involvement with Beyond the Olive came when friends Chip and Crystal Reibel called on her to carry their products in her gourmet food shop, The Bea’s Knees. Before long, the shops merged into one mecca of deliciousness. In many ways, the shop serves as a monument to California products. A Pasadena native, Grabow regularly tours the state to visit olive groves, meet the millers and learn as much as she can. “I love all things California—especially our agriculture. I’ve never had a Georgia peach, Texas grapefruit or Florida orange that can compare to anything grown in our great state,” said Grabow. 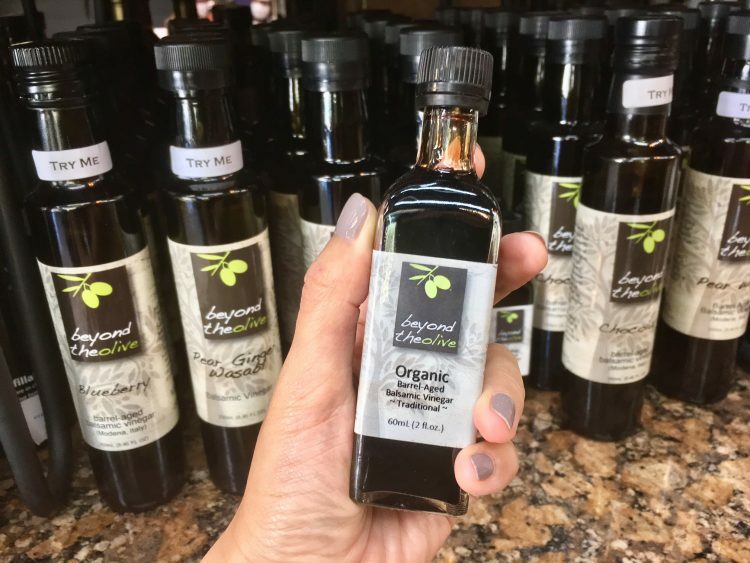 And while vinegars from Modena do grace the shelves at Beyond the Olive, she cautions her clients against grocery store oils—even the ones from Italy. Grabow’s depth of knowledge paired with that of her staff has led to some pretty serious accolades. Along with several wins as Best Specialty Food Store (and even Best Grilled Cheese) from local publications, Beyond the Olive brought home gold and bronze medals for their signature blends at the 2017 Los Angeles International Olive Oil Competition. For Grabow, flavor inspiration is found in her city and its people. “We have an incredible customer base. I listen carefully to their health needs, cooking habits and flavor profiles and curate flavors that they want to use,” she said, perfecting flavors like the spicy Pasadena Blend and Porcini Sage. And while Grabow recognizes it’s fun to browse, she affirms that small businesses make communities more vibrant. Beyond the Olive is located inside of Stats at 120 S. Raymond Avenue in Pasadena. Contact them at www.beyondtheolive.com | 626.844.3866 and check them out at the La Canada’s Farmer’s Market every Saturday. Follow along on Facebook, Instagram or Twitter @beyondtheolive. For souvenirs of traveling to the United States, I would like to present products and foods made in America that are not available in Japan. California, especially olive oil that is gaining popularity as a souvenir selected by tourists coming to Los Angeles. This time we introduce Los Angeles’s olive oil & vinegar specialty brand “Beyond the Olive”, mainly based on olive oil made from California and vinegars of a wide variety of flavors. The first thing you can see when you enter the store is a dark brown glass bottle aligned with the slurry and a large silver container filled with olive oil and vinegar that is set everywhere in the shop. A surprising assortment seems better to call “museum” than olive oil & vinegar specialty store. Beyond the Olive’s olive oil is fresh, made from Californian olives. All the olive oil and vinegar sold in the store can be tasted, and we have about 18 kinds of olive oil at all times. Popular number one is “Albequina”. Featuring buttery taste and mild fruity flavor, this olive oil is active in various dishes. “Early Harvest Albeqina” which is only received once a year. The stock for this year is only the items on the table of this picture. New items will be in stock around January 2017 so please look forward to it. In addition to flavor oil’s classic “Garlic”, “Basil” and “Meyer Lemon”, the moment you put in your mouth, “Big smoked” smell like BBQ’s unique smoke, when you bake chocolate cake etc. A variety of lineups ranging from “Blood Orange” which seems to be fragrant, as well as unique items such as “Citrus Habanero” and “Persian lime”. Unique vinegar flavors are arrayed!At Beyond the Olive, there are over 25 different vinegars in addition to a wide variety of olive oils! “Raspberry & Basil Wine Vinegar”, “Champagne · Mimosa Wine Vinegar”, “Coconut White Balsamic Vinegar”, “Coconut White Balsamic Vinegar”, “Coconut White Balsamic Vinegar”, “Coconut White Balsamic Vinegar”, “Coconut White Balsamic Vinegar” from “Balsamic vinegar that seems to be delicious just by listening to names such as” pomegranate ” Espresso balsamic vinegar “and” pear · ginger · wasabi dark balsamic vinegar “,” A vinegar to such a magical flavor? “, And a unique taste vinegar which is surprised a bit is also prepared I will. The top seller is a balsamic vinegar “25 Star” which has been aged thoroughly for 18 years. It has a sweetness, which is characterized by its drought like syrup, and compatibility with flavor oil is outstanding. The second most popular is “fig” flavor. This is also aged for 18 years, it is thick balsamic vinegar like melted chocolate, it contains grain of FIG. For souvenirs we recommend mini size or medium size! Also, a seasonal flavor was developed at about once every 1 to 2 months, and when visiting the shop in early October, autumn flavor “pumpkin spice balsamic vinegar” was on sale. Besides olive oil and vinegar, stuffed olives (10 to 12 dollars) packed with various ingredients such as blue cheese and sun dried tomato, and various original jams are on sale. A sweet little shop run by lovely and committed people. They feature a great selection of California artisan olive oils, and really make that connection with the producer that brings olive oils to life. You will find things there that are usually available only from the producer — very small production and truly special. They have a great educational program with visiting chefs and meet-the-producer events. Located across the street from - and what was once part of - the historic luxury Hotel Green, The Bea's Knees Wine and Cheese store is a magical gem on Raymond St. in Old Town Pasadena, CA. A California Historical Landmark, Hotel Green was built in 1893 and designed by Frederick L. Roehrig. It was home to the beginnings of the Tournament of Roses association. The shop's friendly wine guru Robert Ramirez greeted us at the door of the iconic STATS Floral Supply building, and introduced us to their unique and super yummy vinegars and oils while he refilled my bottles.... Have a look! The highlight of this weekend's Artisanal LA experience was hands down the artisan Olive Oils and Vinegars from Beyond the Olive in Pasadena. Jennifer Scott takes us on a delicious tour of flavors like Champagne Mimosa Vinegar and Blood Orange Olive Oil, which I combined to make a vinaigrette for my Arugula and Fennel Salad with Apples and Olives. Next I'm going to try the Bordeaux Cherry Vinegar mixed with Strawberries over ice cream. The oils all come from California Olives. All of the products come in beautifully etched bottles that can be refilled at The Bea's Knees Wine Cheese Gifts & Cafe at 'The Shoppes at Stats' in Pasadena in keeping with their motto "More Refills, Less Landfills." Food is a big part of the holiday season no matter what holiday you celebrate. From Halloween to New Years, food traditions bring us together.With that idea in mind, Lisa Grabow of The Bea’s Knees keeps a carefully curated selection of high quality foods in stock. Her gifts are perfect for the foodie who has everything or for the amateur chef in your life. 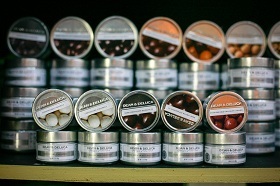 Grabow recommends getting things started with their exotic salt bar and small containers of high-quality spices like ground ginger and truffle salt.The Bea’s Knees is located at 120 South Raymond Ave, Pasadena. Call (626) 795-9308 or visit www.thebeaskneespasadena.com for more information. 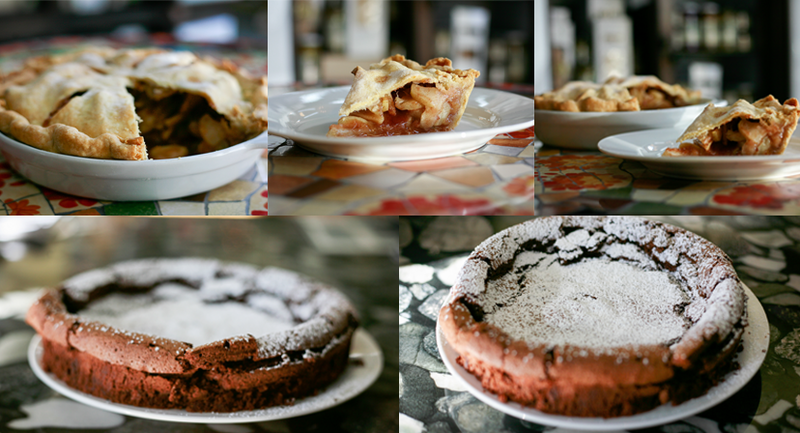 Freshly baked goods: pumpkin pie and flour-less chocolate cake. It’s hard to think about the holidays without the food. Imagine Thanksgiving without the turkey (or turducken, if you’re feeling fancy) or Christmas without the gingerbread and eggnog. But, with the holidays hustle and bustle, it can be hard to plate that perfect pie or curate a mouthwatering cheese board. There’s no shame in getting a helping hand from the kitchen elves at the Bea’s Knees. Nestled in the Shoppes at Stats, this gourmet eatery is a return to artisan foods. Lisa Grabow opened The Bea’s Knees 2 years ago by pulling food artisans from Chef Center, Pasadena’s commercial community kitchen. Grabow focuses on local, Southern California food artisans. She has nougat made in Altadena, honey from Pasadena and olives grown in state, not to mention the appetizing selection of freshly baked goods, including pumpkin pie and flourless chocolate cake. Order an all-American Apple pie to complete your next gathering. Drop off your own pie plate in advance for a dessert that truly feels homemade. The stunningly beautiful crust and sweet-but-not-too-sweet filling will leave your guests in a post-pie coma. On the more savory side, a handcrafted cheese board is the perfect start to any celebration. Grabow has an impressive selection of cheeses and makes a point to source sustainable products. Cheese boards make a thoughtful hostess gift to the chef that has everything. Grabow recommends ordering a week in advance for parties of 20 or more. “Food is what culturally brings us together,” said Grabow. It just wouldn’t be the holidays without it. The Bea’s Knees is located at 120 South Raymond Ave, Pasadena. Call 626) 795-9308 or visit www.thebeaskneespasadena.com for more information. Although we enjoy sunshine all year long this is Pasadena, after all), summer remains the most popular season for eating outdoors. Pack your picnic basket and take your next meal outdoors. From gourmet fare to comfort food, there’s no wrong way to picnic. Follow these tips from Lisa Grabow, Owner of The Bea’s Knees in Old Pasadena and Amy Vigouroux, General Manager of The Kitchen for Exploring Foods. Packing a picnic is half the battle, luckily, The Bea’s Knees offers an array of picnic baskets from a wine and cheese-centric case to a large 4-person kit complete with a throw blanket. These wicker wonders come stocked with plates, utensils and cutting boards; many also have special compartments for wine or beer. Grabow adds that The Bea’s Knees packs custom picnics if you drop off your basket and give 24 advance notice. For toting wine or beer, try a bag instead of a bottle. These collapsible flasks and bags make it easy to bring your favorite beverage without lugging around a bottle. In addition to wine and growler bags, Grabow also stocks stylish wine cases and carriers. Seasonal produce reigns supreme all summer. From citrus-infused salads to peach cobblers, the best place to draw inspiration is from the Farmer’s Market. The Kitchen for Exploring Foods has a daily selection of sandwiches and salads that can easily turn into a picnic. They also offer pre-order picnic boxes which come with a sandwich, salad and small dessert. Grab a nostalgic soda, like Bubble Up, when you pick up your food. Sandwiches and salads are just the beginning. A picnic can also include fun items like chips, dips and charcuterie or cheese plates. “A great cheese plate has something that will please everyone. It can cleanse and reinvigorate the palate,” Grabow. She offers a rotating selection of cheeses – each with its own mini-history – and creates custom cheese plates with fresh fruit and nuts. She adds that cheese is ideal for a picnic because the flavor gets better with age. Grabow adds that hard ciders are very popular in the summer because they are dry, bubbly and refreshing. The Bea’s Knees offers apple, cherry and oak barrel aged ciders. Grabow recommends pairing cider with creamier cheeses because the evanescence helps cut through the fat. She also suggests a summer wine that cools the palate. “Roses are the most popular because of their short shelf life – you wouldn’t want to go older than 2014 – and their nice fruitiness,” said Grabow. Still, she doesn’t shy away from white, bubbly or even reds. In particular, she suggests Escudo Real’s Vinho Verde for its low alcohol content, so you can enjoy it without regret the next morning. Keep it simple with mess-free desserts like cookies and brownies. The Kitchen for Exploring Foods retails their ginger cream cookie sandwiches and has a selection of freshly baked goods on hand daily. Call ahead if you have your heart set on a sweet treat – otherwise stop by and be pleasantly surprised by mini-pies and cookie bars. Stop by The Bea’s Knees for nostalgic jam thumbprint cookies filled with their homemade jam or chewy chocolate brownies and peanut butter cookies. “Sometimes a picnic is just for the sake of a picnic,” said Grabow. While summer concerts and outdoor events are popular picnic times, there’s no need to have a reason to enjoy a picnic. Grabow adds that Pasadena is filled with picnic spots like Memorial Park, the Arroyo, the Rose Bowl and Laurel Canyon. Vigouroux adds that food safety is important to remember, especially in the hot weather. Keep food chilled with ice packs or in a cooler and consume your picnic within two hours. "What you need to know to pick right olive oil"
LOS ANGELES (KABC) — Americans take a mere 24th place in the world when it comes to olive-oil consumption, which is too bad because it’s a heart-healthy fat with many benefits. But from cold pressed to flavored, there’s a lot you need to know before choosing the right type. “The procedure for sampling and tasting olive oil is exactly like tasting wine. 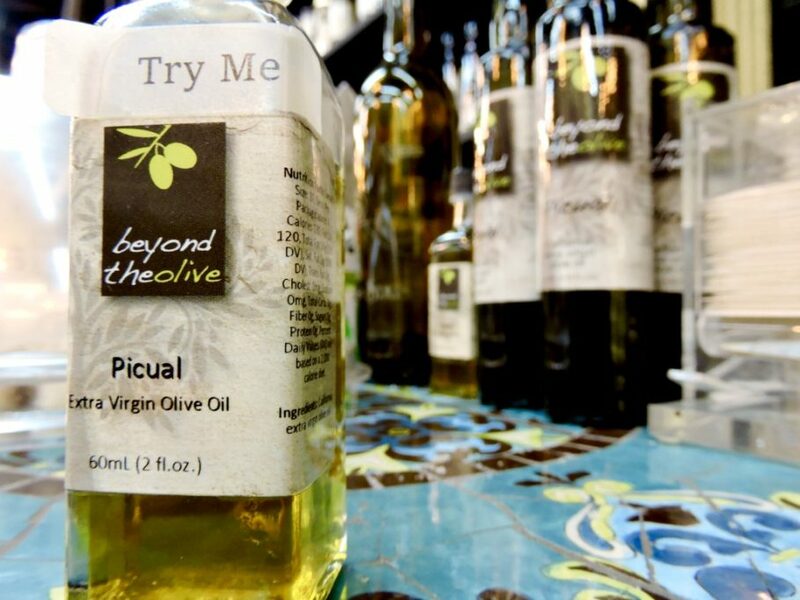 You’d take a sip, aerate the oil in your mouth, consume or swallow the oil and then exhale thorough your nose,” said Chip Reibel of Beyond the Olive in Pasadena. He and Crystal Reibel own Beyond the Olive, where tastings help consumers learn more about olive oil, starting with color. “Color doesn’t mean anything with the flavor of olive oil. Mentally, people think, ‘Oh, it’s a bright green color, it’s going to be grassy, it’s going to be robust,'” Reibel said. A cobalt blue glass is used to disguise color and encourage use of taste and smell instead. “What you really want to look for is a date of harvest or a best-when-used-by. There’s a very short shelf life on olive oil,” Crystal Reibel said. Crystal Reibel says olive oil goes rancid between six and twelve months, so don’t buy too much. “You want to make sure that when you do get your olive oil, that you keep it with an airtight pour,” she said. When it comes to storage, heat, light, air and time are the enemy, so store yours in a cool, dark pantry, not sitting on top of your stove. It’s also helpful to buy dark bottles to protect against light. Then, there’s the term “extra virgin.” “It’s an olive oil made solely with olives, there’s nothing else added to it. It’s mechanically pressed within 24 hours of harvest, no chemicals added or heat,” Crystal Reibel said. With over 600 growers and manufacturers of olive oil, California has government regulations on the term extra virgin, yet the United States does not have strict guidelines on imported olive oils, so Crystal says an imported extra virgin olive oil might possibly be a blend. The same holds true for “light” olive oil, which means light in taste, not light in calorie, and is also a blend. What does the term “cold pressed” mean on olive-oil bottles? “The first time that you extract the oil out of the olive paste is your first cold press, that’s your best quality oil,” Chip Reibel said. Finally, if buying a flavored olive oil, choose one where the fruit is crushed with the olives rather than infused versions for the best flavor.